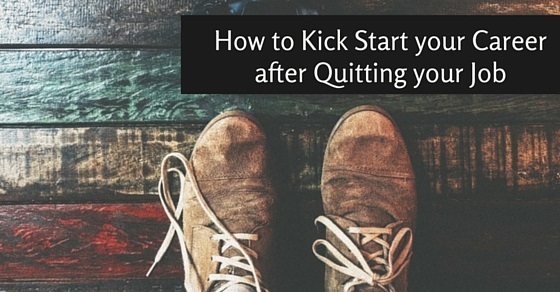 How to Kickstart your Career after Quitting your Job? In this day and age it is absolutely essential to have a job in order to make two ends meet and to attempt to keep you head above water. However it often happens that due to certain personal or professional reasons people decide to quit their job and then they find it tough to get back on the horse and kick start their career once again. So given here is a list of things that help kickstart your career after they have quit their job. How to Kickstart your Career? The decision to quit your job is not small one, yet after you have quit it chances are that there will be a lot of things playing on your mind. You should never let too many negative thoughts come into your mind and take a toll on you. If this is a decision taken by you after careful weighing and measuring then you should not keep feeling bad about it. Having a positive frame of mind will really help you to go ahead and achieve even greater things in life. Remember that you are not the first or last person to have quit a job so you should not worry so much. Once you have taken the decision to quit, you should not keep being in doubt whether or not you have made the right decision or not. The very fact that you were harboring thoughts of quitting implies that you were not happy doing the job. One should never be doing a job which he or she is not truly passionate about. It is only when you are passionate about your work that you will be willing to put your heart and soul into what you do .Companies that value their employees will look into their needs and never let them feel like they could be better or somewhere else. When you have quit your previous job you should not think of it as an ending with nothing to look forward to a head in life. Rather you should perceive it as a new beginning. No matter what your age is or where your interest lays you should never shy away from kick starting your career a second time. If you are confident in yourself and have faith in your ability then the sky is your limit and you can achieve anything which you set your heart on. Put in your best and you are sure to reap rich dividends in the future. Once you have quit your job, unless you think that you need to, you ought not to look for a job immediately. What you must do is take some time off and clear your mind. Once you are able to clear your mind then only will you be ready to embark on a new adventure and with new lease on life. In this day and age, no day at the office is smooth sailing. Everyday there are multiple problems and issues which crop up which employees must be ready to handle if you are physically mentally or emotionally weak, how will you ever be able to handle your work related stress. One thing you should certainly do after you have quit your old job and kick start your career again is go on a vacation alone so that you can really take some time off and distress. Spending some time in the lap of nature and away from the hustle and the bustle of the town will do you a world of good and it will help you recuperate and get over your stress. Vacations are truly great to help you really understand what is important in life. You can gain a new perspective and be able to look at the bigger picture rather than focusing on small and petty things. Only after you know yourself well that you will be able to kick start your career properly and correctly. Do not do something which your heart is not truly set on, rather do something which you really love doing. No matter what they pay or what the social stigma attached to the job is, if your joy comes in being in that line then you should not think twice about taking it . Your job will certainly not feel like a burden to you if it involves something you love doing. So take some time off to actually get to know your own self better and understanding where your talents lie. If you have some plans in mind about how you can kick start your career once you have quit your job, then you could always discuss it with your friends and family. As you grow older and gain some wisdom, you will realize that the only people who truly care about you and your happiness are your family members. Others are most likely to grow bored as well as jealous over time, but your family members as well as loved ones will never stop being happy for you in your success and giving you a shoulder to cry on when you fail. The only way where you can properly kick start and decide on a career to embark on is by knowing where not only your interests but also your abilities lie. If you find yourself at sea about what you should do then you should not think twice about consulting a career counselor who will be more than able to guide you along your way and help you to make the right decisions. Having a strong as well as reliable network is something that is absolutely vital if you want to be able to kick start your career after you have quit your previous job. Your network should comprise of any and everyone who is a relevant part of your field of work and you should always try to be up to date about advancements taking place in your field as well as new ways in which you can improve your method of working. The more outgoing you are, the better it will be for you in the long run as well. Once you have quit your job, you could consider kick starting your career once again by doing something which is new and novel. Even if it is a career path which has been seldom tread upon you should not shy away from doing something revolutionary. Even if you stumble or hit some obstacles in your path you should always be persevering enough to finish every task that is given to you to do. The more things which you try your hand at the faster, you will be able to find the perfect line for yourself and then you can kick start your career, without looking back. Once you have quit your job, you might even consider gaining some more qualifications to help you when you do decide to kick start your career once again. Without the proper credentials and qualifications no big company is likely to see you as a candidate for their top jobs. However this having been said, remember that having qualifications alone cannot guarantee that you will be able to do well in the professional, corporate world. After quitting your job and trying to get back on the horse once again you should first ensure that you know exactly what you hated about your previous place of work. You must ensure that the places where you apply now, do not have the same issues or problems. You would certainly not want to find yourself back in the same position all over again. So doing some research and talking to employees of that organization could help you to make the right decision. In this day and age, no recruiter has the time to actually have a long drawn out interview with you. The first thing you are judged upon, is your resume so ensure that you prepare a resume that is likely to really impress and excite the person reading it. Make sure that your CV is not merely a summation of your educational qualifications as well as your talents. In this day and age a CV is like a marketing and advertising tool where the product on display is you. In order to kick start your career once you have quit your previous job, you have to ensure that you wait for the right kind of job which comes your way. Never make the mistake of simply taking up any and every job just for the sake of being employed. If you are associated with top companies with a good reputation, then you are automatically ensuring that your CV looks very impressive indeed. The best way to kick start your career is by taking into consideration all that your mentors and acquaintances have to say, but doing exactly what you feel is right. It is better to go ahead and take calculated risks rather than having regrets at a later point in your life. If you do your part, you are sure to be blessed. Kick starting your career after you have quit your job is something that is an admirable thing to do. However you must ensure that you do not expect things to happen overnight. Be patient and give your hundred percent at all times and you are sure to make it big in your professional life. So these are some of the things which you can do to kick start your career once again. This might sound like a cakewalk for you, but in reality things are certainly not going to be easy. Just remember that in this day and age, due to the stiff competition and limited number of jobs, getting a job is very tough indeed. So ensure that you have some sort of plan before just quitting. However remember that if you feel like you are being exploited or not appreciated then you should not stand for that either. Previous articleWays to Find a Job Without Using Job Board or Internet?